It was a mix bag of weather for Labor Day weekend 2013. There was something for everyone. On Friday, the winds were from the Northeast at 15-20 knots (no small craft warning) with comfortable temperatures. On Saturday, the wind were from the South at 5-10 knot with warmer temperature (but there is alway the afternoon sea breeze). On Sunday the wind were from the Southwest at 10-15 knot with higher humidity and temperatures. So there was something for every body. Michele and I was debating on our cruising destination for the weekend. I was off on Friday, because Monday was regular work day for me. Our options were to cruise to Cape Lookout, or to cruise to Taylor Creek in Beaufort, NC. The first step was to get underway. Usually my wife frown on getting underway with 20 knots winds, especially out of the Northeast. 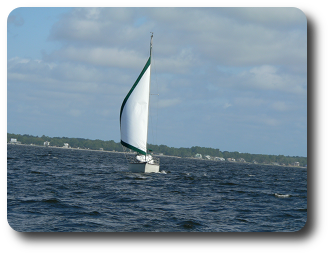 It can get rough on the Neuse River with a Northeast or Southwest wind. We departed the basin at 09:45 AM. There was plenty of water in the channel to navigate Whittaker Creek. I notice that the number #3A can buoy was gone. The channel is narrow, so hugging the red was priority. Two sailboats ran aground on our back in Friday afternoon. One them was at the spot were the number #3A can buoy was located. The other sailboat in the middle of the channel after the number #1 daybeacon. In 2011, hurricane Irene change the channel and damage the Whittaker Creek Day range dayboards. After clearing Whittaker Creek Channel, we headed Northeast to bring up the jib. The wind was blowing at 17 knots and we hoist the jib. We decided that sailing with jib will be fine. It didn’t take long to decided that heading toward South River would be rough ride. We had our dog with us (Ziva) and she isn’t a water day. Ziva might look like a black Lab puppy, but she is far from it. We jibe and set a course to Adams Creek and the ICW. We were enjoying a nice cruise. The wind was at our backs (on a run). We were averaging 4 knots with just the jib up. The next step was to decide our destination. Cape Lookout was out, because it would be long day on Sunday; a six hours course back to Whittaker Creek, then two hours to clean up the boat, then another three hours drive home. It was probably a good thing we didn’t go to Cape Lookout, because Raleigh received over 4 inches of rain later Sunday afternoon into the evening. Sailboat heading toward the ICW destination unknown. Taylor Creek would have been four hour motoring the ICW. It was nice having the sails up and coursing down river. On our run to Minnesott Beach, we are past many sailboat heading toward the ICW and Adams Creek. We were able to enjoy lunch while underway. After lunch, we decided to tack into the wind and zig-zag our way home. Sailboat on run down river. Our first tack home was at 80 degree True. We were keeling at 15 degree heading toward Courts Creek. The winds were still out of the Northeast, but calm down to 13 knots. We were averaging 5.5 knots on each tack, while sailing 30 degree off the wind. We had a good day sailing. Sailboat heading up river toward the ICW. September 2, 2013 in Sailing.